On July 8th the music world had to say goodbye to one of its most inspirational members. “Uncle” Lionel Batiste passed away, at the age of 81, due to an illness. Newspapers – New York Times, Washington Post and many others – and websites have reported the sad news and have written about a great person that was loved by everyone he met during his life. This is how we have decided to remember him, with an article that we hope can tell, at least a little bit, who Uncle Lionel was. Lionel Batiste was born in New Orleans on February 1st 1931 and has been passionate with music since his childhood. He started playing the bass drum at the age of 11 with the Square Deal Social & Pleasure Club. That was just the beginning of a journey that made him a real icon, a sort of legend. He was always kind, greeted whoever he met while walking around the streets of New Orleans – or wherever he might have been – and was a real inspiration, especially for young musicians of the Crescent City. He had a charisma and charm similar to that of some great prince of a medieval tale. He was a great man that even the fury of hurricane Katrina couldn’t managed to scare. During the hurricane he managed to save himself by floating out on the top of his bass drum. An incredible feat, especially when considering he didn’t know how to swim. He was well-known for being the bass drummer, vocalist and assistant leader of New Orleans’ legendary marchin’ band Treme Brass Band. 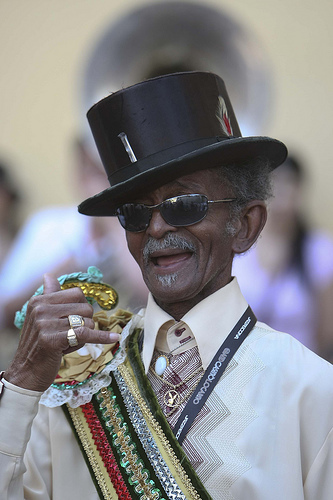 His kazoo playing, his dressing style and his singing made him a legend, an incarnation of the music, spirit and culture of New Orleans. Other recent highlights of his career was his appearance on HBO’s TV show Treme – a series with a cast full of Hollywood stars such as John Goodman, Steve Zahn and David Morse – in which he portrayed himself. In addition to this, he was featured in the 2010 New Orleans Jazz and Heritage Festival – surely an honor to every New Orleans’ native – and appeared on the promotional posters of Spike Lee’s documentary about the aftermath of hurricane Katrina If God Is Willing and Da Creek Don’t Rise. He was also famous in Europe, especially for his performances as leader of the Moldejazz parade – at Molde International Jazz Festival in Molde, Norway – and for his appearances, as main act, of the last six editions of international Swiss jazz festival JazzAscona. Last year in Ascona he was awarded the Ascona Jazz Award, an award adding to his incredible and unique career. He left us surrounded by his family and friends, moral support coming also from his fans and friends all over the world. His absence was felt everywhere from New Orleans to Paris. Many artists have paid and will pay tribute with parades, concerts and prayers to one of the most kind-hearted people the music world has ever seen.